From the Democrat Nancy Pelosi who brought us the comment, “we need to pass Obamacare in order to find out what’s in it” comes the following ignorant defense of Obamacare waivers. Pelosi actually defended the 1800 Obamacare waivers by saying that …“They’re Small Companies” (VIDEO). McDonalds, one of the nation’s largest employers in recent years, has received a waiver. Really, small companies Nancy Pelosi? Is McDonald’s a small company? Who knew a company with well over 1.7 million employees and franchises worldwide was considered a small company. How about the state of Maine, is that a small company as well? Waiver list can be found HERE. So small businesses are insignificant? lost soul heading to hades. I read where obama has committed over 50 impeachable offenses and numerous felonies and that he is indeed an illegal alien and that the republicans are scared to death of him. Our country is lost if this terrorist is reelected. Someone hide me. 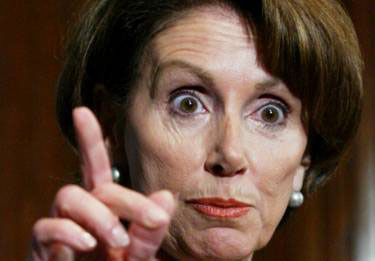 That pic of Pelosi is downright scary. On the other hand, after Halloween the rest of us can take off our masks. Super Dave–I agree with you. Why are the Republicans afraid of Hussein Obama? He should be impeached but the only thing Boener does is write him letters saying how shocked he is. Not one good man in the bunch. Sadly, I think our country is already lost. No one has the courage to defy him. I am a small company with one employee. Wonder how I can get on the list? #6: notice that there are no democrats running against obama. something is wrong here ? my guess is that he has strongarmed and bullied anyone even thinking about running against him. all we need is one brave democrat to step up and that would give another party a chance. to even think about 4 more years of democrat rule is scary but anything isd better than obama. well, except maybe the idiot Joe Biden. the republicans haven’t shown me any guts to do anything but cower down to obama. we are in big trouble !!!!!!!!!!! !